Pashmina is one of the most luxurious and fashionable materials available in the world today. For centuries, garments woven from Pashmina have been adored by the world’s elite. In contemporary society, the style and elegance of Pashmina has an allure that is desired by everyone and especially those seeking the most glamorous attire. Pashmina is the name given to the wool derived from the neck and under-belly of the ‘Capra Hircus’ goat that thrives in the Himalayas at altitudes above 12,000 feet. At this altitude, the natural Pashmina fibres are extremely fine (between 10-14 microns in diameter, or 6-8 times thinner than a human hair) which gives Pashmina garments an incredible warmth-to-weight ratio. 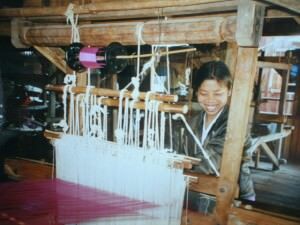 The photograph to the top left shows a lady working at one of the traditional hand-looms.